Fine-grained Parian marble. 2nd century. Height 20.2 cm. Saint Petersburg, The State Hermitage MuseumInv. No. A. 523. 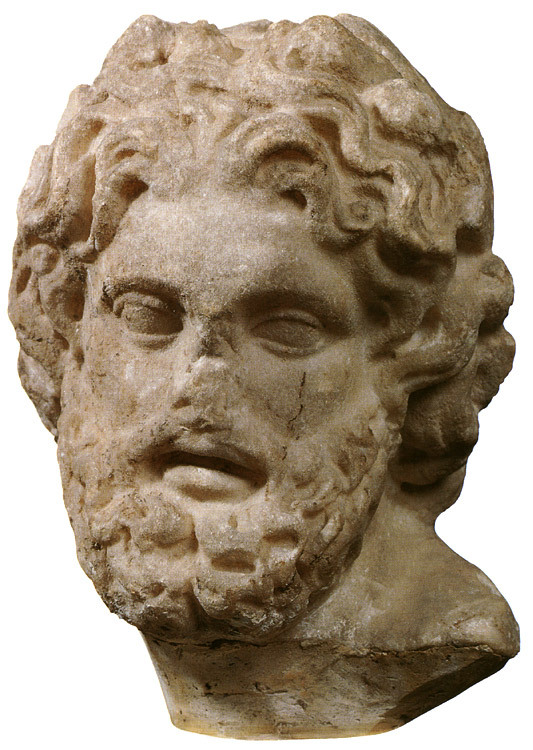 The god’s head, turned towards his left shoulder, belonged to a statue. The god wore a pine wreath. The hair shows the influence of effigies of Alexander the Great, who set a fashion in sculpture. The face is framed by thick hair, falling symmetrically in heavy locks at both sides, and by a beard. The deep-set eyes express little emotion. Only the partly-open mouth gives the face an ecstatic and dreamy quality. O. Waldhauer, Die antiken Skulpturen der Ermitage (Berlin, 1931) no. 48 p. 8 pl. XXIX. © 1993. Photo, text: Olympism in antiquity. Olympic Museum Lausanne. Bertelsmann UFA. Industria Gráfica S. A. Barcelona, 1993, p. 73 cat. no. 16.